Two ingredients make this simple pasta dish so delicious: the flavor imparted from salami or Italian sausage, and the crunch of the fried breadcrumbs. It's an easy recipe to adapt, so long as you include those two things. I first saw this "blokey, hardy" Tuscan dish in one of Jamie Oliver's books, and have since streamlined it into a house standard. Make the sauce: In a large pot or deep-sided sauté pan, warm 2 tablespoons of the olive oil over medium heat. Add the sausage or salami and cook for several minutes, until the sausage is no longer pink or the salami begins to crisp. Add the fennel seeds, red-pepper flakes, and sliced fennel bulb; cook over medium-low heat for about 5 minutes, stirring often. Add the tomatoes and their juices. Cook the sauce at a simmer for 20 to 25 minutes, stirring occasionally, until the sauce has thickened. Season to taste with salt, black pepper, and more red-pepper flakes, if desired. Make the pasta: While the sauce is cooking, put on a large pot of salted water to boil for the pasta. Cook the pasta according to package directions. If the tomato sauce seems too thick, add a ladle or two of the pasta cooking water to the sauce. Make the breadcrumbs: While the pasta water is coming to a boil, cut the de-crusted bread into small cubes, then pulse the cubes in a food processor until broken into small crumbs. Heat the remaining olive oil in a large pan, add the breadcrumbs and a pinch of salt, and fry the crumbs in the oil over medium heat, stirring often, until the crumbs turn a lovely golden brown. Remove from the heat. 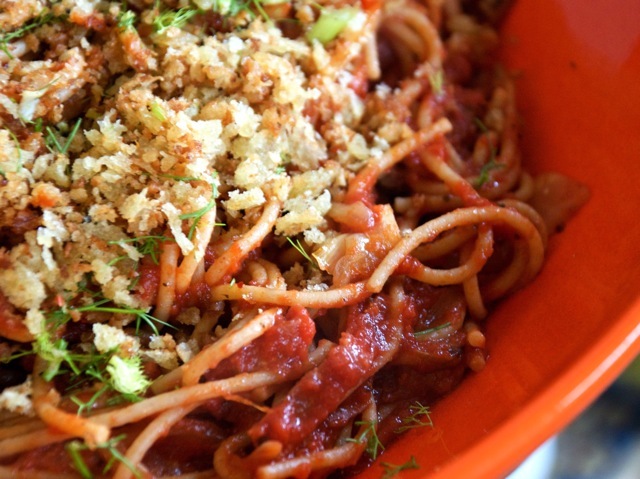 Assemble the dish: Toss the cooked pasta with the tomato sauce, then top with the crispy breadcrumbs and the reserved, chopped fennel tops.